A recent article from Australia's Sunshine Coast Daily caught our attention with the headline, Boat's name a tribute to surroundings. You guessed it... the article is about a boat name, 'cuz that's what we do here. Even as we haven't done that here in a while. Perhaps now is a good time to 'tern' over a new leaf. Pun intended. This particular story is about a charter cruise company that had an unnamed boat for more than a dozen years. They finally decided to name the boat by way of a contest, and with more than 150 entries, the name they came up with was "Tern o' the Tide". 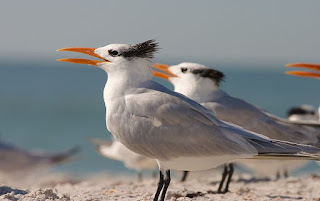 They apparently have a lot of terns in their local waters, so the name makes a lot of sense. We'd send them a congratulatory embroidered boat name hat, but unfortunately shipping to Australia from here in New England is prohibitively expensive.